Pudget: Losing Weight On a Budget! 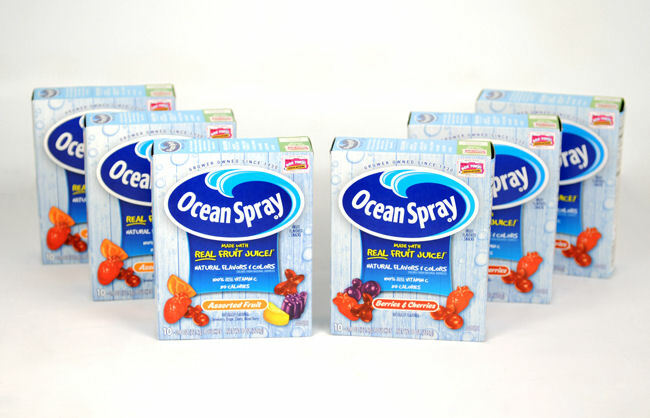 : Ocean Spray Giveaway - 4 Winners!!! Ocean Spray Giveaway - 4 Winners!!! I'm pretty excited about this Giveaway Post. The reason why is because I get to choose four winners!! That's right! This is my first giveaway that I have been allowed to choose this many winners. It's also a pretty cool prize pack! The fruit snacks came in the mail and I thought I was safe. Honestly I have never eaten a fruit snack that I have liked. My girls love them so I thought I would just let them review them. One night my youngest daughter was eating a pack and they smelled so good. I then made the mistake of eating one, and then another and another. I'm sure you can see where I am going with this. They are awesome. Honestly the best fruit snacks ever!!! For a few moments I totally understood my sister. Yes, I did share with her. I gave her two boxes for her family. I'm not sure if the kids got any but I do know that my sister enjoyed them. She told me the next week she went to walmart and found them for less than $2 per box with a $1 coupon off each box. Pretty nice! Ok, here comes the fun part. 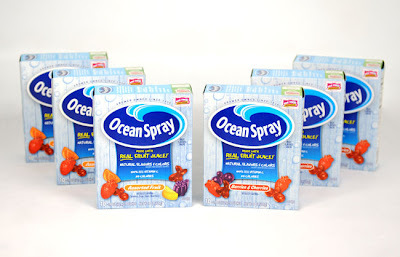 Time to enter for a chance to win (6) boxes of Ocean Spray fruit snacks. 4 Winners will be chosen to win this prize pack. 1. Let me know if you like fruit snacks or not. If you do, what is your favorite fruit snack brand. 2. For a second entry post on your blog about this contest and include a link to my blog and post the link in the comment section. 3. For a third entry become a follower. If you are already a follower just leave that in the comment section. 4. For a fourth entry add my button to your blog and post the link in a comment below. 5. For a fifth entry add me as a friend on Facebook by clicking here and then leave me a comment telling me you did so. The Winner will be chosen using a random number generator. All entries must be received by Friday, February 10, 2012 at 11:59 CST. The winner will be announced Monday, February 13, 2012. For U.S Addresses Only. MyBlogSpark is responsible for sending the prize pack. Disclosure: The Ocean Spray Fruit Snacks were provided by Ocean Spray and MyBlogSpark. I'm like you, Jessica. I'm not really into fruit snacks, but my 4 year old son LOVES them! We haven't tried Ocean Spray brand, didn't even know they existed. Thanks for a chance to win! I like fruit snacks but don't buy them too much... they are expensive for what they are! Also the brand doesn't make a difference to me really. I like fruit snacks. I have not tried the ocean spray ones yet but I do really like the 100% fruit ones like Welch's. I do like fruit snacks; however, I can do without them. They're not addicting to me. But, our 3 year-old really likes them and will snack on them daily. I like fruit snacks, but I don't have a favorite brand ヅ *Thanks* for the giveaway! I'd love to win these. My favorite fruit snacks are Welch's. I like fruit snacks, but generally think of them as for my kids. THESE look awesome, I would eat these. I usually buy whatever is on sale they kids don't really care but these look good! thanks! These look awesome. I like the Welch's fruit snacks. I personally don't like fruit snacks but my kids love them. They don't have a favorite brand...they like them all!! Brennen would love to try the fruit snacks. The loves anything fruit flavored!